We know how frustrating it can be when your Freeview signal starts to pixelate or even stop working altogether. This could simply be a matter of a weak TV signal and you may even already be seeing the “weak signal” or “no signal” message on your TV. If you need to improve your TV signal strength, then as an expert TV Aerial Installer I recommend reading on to find out how you can do this. 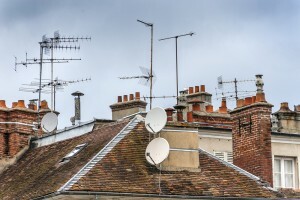 TV aerials are almost always installed on chimneys and there is logic behind this. 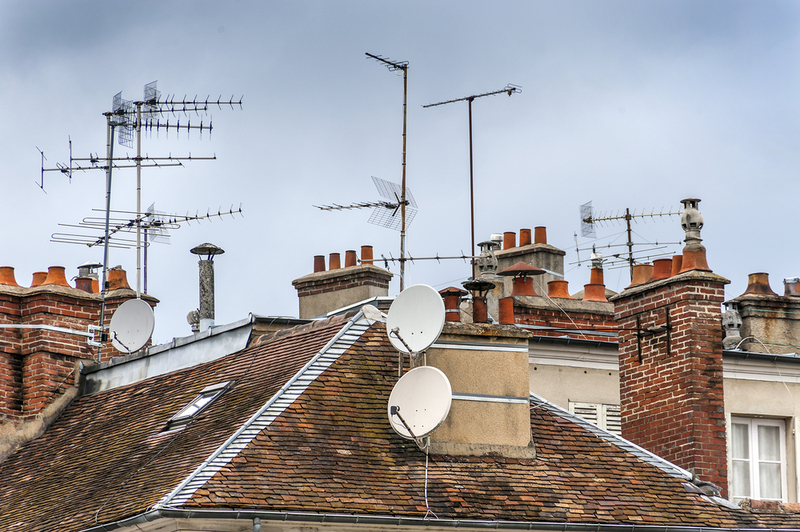 Your TV aerial should be installed at the highest point of your house, particularly your chimney, to avoid any nearby obstructions like neighbouring buildings or trees. This will enable your TV to receive a strong signal as there is a good line of sight between the transmitter and your aerial. Installing your TV aerial outside is the best thing you can do to improve your TV signal if it is not already installed there. This advice applies to people who have a loft TV aerial mostly, because they will benefit most from installing their aerial outside the home so the signal isn’t passing through the roof. If simply installing your aerial outside doesn’t improve your signal enough, you can always install your aerial higher up, raised above your chimney. 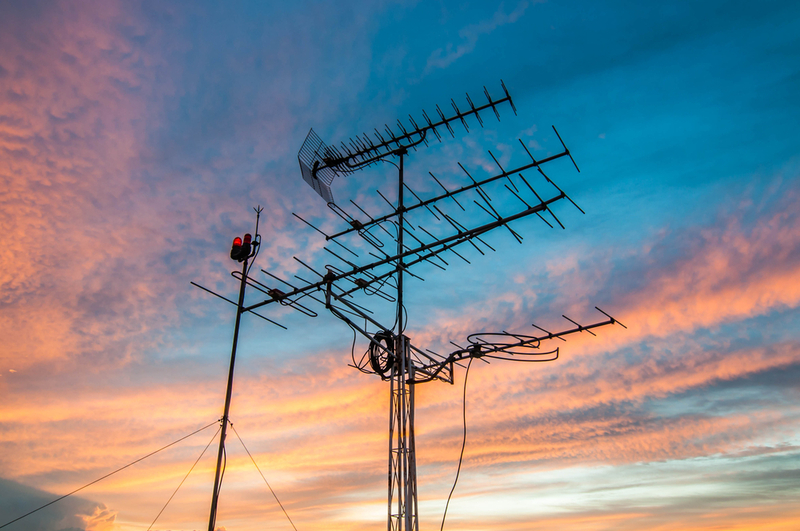 This means that if you live in an area with poor signal, you could benefit from installing your aerial onto a 10’ or 12’ mast instead of a 6’ mast to help clear any nearby obstructions. For safety purposes, your fixings must be big enough to support your aerial – roughly 1/6th of the total height – otherwise your aerial could be blown over in the wind. If it isn’t possible for you to install an aerial on your roof or outside your home and you have to use an indoor aerial, it can be a good idea to move up to a loft aerial. This will improve your TV signal greatly (if your roof is now foil lined). 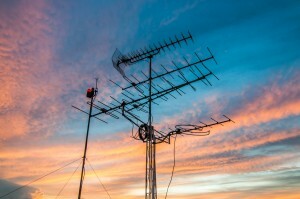 One of the other ways to increase your TV signal is to install a higher gain TV aerial. These usually aren’t necessary if your aerial is installed outside but if you live in an area of weak signal or will be running multiple TV’s off one aerial, they can be a great idea. High gain aerials have more elements in their aerial boom which helps to improve their performance by improving the acceptance angle and therefore the signal that is received. Additionally, this also means that they are larger than traditional aerials so they need a stronger structural support to carry the weight. This suggestion is one the less easy ones for someone manage on their own without an alignment tool or TV spectrum analyzer but having it done professionally could make a huge difference to your TV signal. This becomes even more of a benefit if you have a high gain TV aerial where your TV aerial alignment needs to be more accurate. If you’re struggling with this, please give us a call and we will get someone out to you as soon as possible. If you have done several of the suggestions above and your TV signal is still weak then the next best thing to try would be to install a masthead amplifier. If you choose to install an amplifier for your TV aerial, it is best for you to install it as close to the aerial as possible, as this will boost the signal throughout your system. Of course, this means that on the masthead outside would be the perfect place to install the amplifier and power in supplied from behind the TV through the aerial cable. Masthead amplifiers are used to overcome cable losses and signal losses that associated with splitting the signal to multiple TVs. Although, if you generally get a weak signal, you will see some benefit in using an amplifier. The amount of gain will differ from model to model so it would be best to find the right one for you before installing. Using passive splitters to run multiple TVs from one aerial increases the signal loss as more TVs are added to your system. Under normal circumstances where a strong signal is experienced, this isn’t usually an issue for up to four TVs in a household. However, if you have weak signal and/or want to run five TVs upwards you could be losing a lot of signal when you’re using a splitter. This can be resolved by using a distribution amplifier with multiple outputs to different TVs, reducing signal loss and improving the signal strength to all TVs. Usually, a four way distribution amplifier will have a 10dB signal boost meaning your TVs will receive 18dB more than if you were to use a passive splitter. Although it goes against logic, the more TVs you add to the system, the greater the signal received by each will be. While this is a great way to increase weak signal, it isn’t the best solution for all signal areas. A weird situation you could find yourself in is that your aerial could be aligned to a transmitter that isn’t the optimal one for your home. This is commonly found in areas where one of the transmitters received Freeview in your area earlier than another, causing your aerial to be aligned to that one, while the other one was being upgraded. Most people won’t have had their aerial realigned once the optimal transmitter started outputting the Freeview signal. This is a problem we are still rectifying with customers to this date and you may find that this situation is occurring for you too. You need to be careful that you don’t realign your antenna to a Freeview Lite transmitter as you will receive roughly 50% of the services offered. Now, this kind of goes against what we said about installing aerials high up on the exterior of your home. You may find that positioning your aerial at a spot lower on your home to avoid possible obstructions could work wonders for the strength of your TV signal. This is why installing TV aerials is often referred to as a “black art” because you can often find that installing your TV aerial lower down or in locations that seem like they may not work is actually the best position for your aerial. It’s a good idea to test different locations on your property but this will be time consuming. More often than not, it does end up being at a higher elevation, but it is worth having someone check it out. Check out our excellent reviews on Google! Responsive, good value and helpful. We had poor Sky signal on our old dish, possibly due to trees growing higher. I contacted Neil by email on Sunday evening. Neil and his men arrived 9:00 Monday morning, and they had replaced Sky dish in new location, with new cables and tidy job completed in under an hour. I would highly recommend Aerial Waves. These guys are great. Had a new aerial fitted, aerial points put in and a tv wall mounted all in just over an hour. Hardly any external wires showing. Really pleased and would recommend to anyone. Amazing from quote to finish! Came when they said they would, lovely people, very tidy, and all at a very good price! We’ve Just Got a Mini Cooper to Advertise Our Business, Look Out for it Around Halifax!